Left to right: Helsreach Mayor, Grox Egg and Olivia Neutronbomb. I really like event-exclusive miniatures as they’re tethered to a set of memories of friends, games, meals out, heavy drinking, stupid decisions and hangovers. Lemme explain why these three minis came to be. Olivia was the 2017 event’s commemorative figure, sculpted by John Pickford. 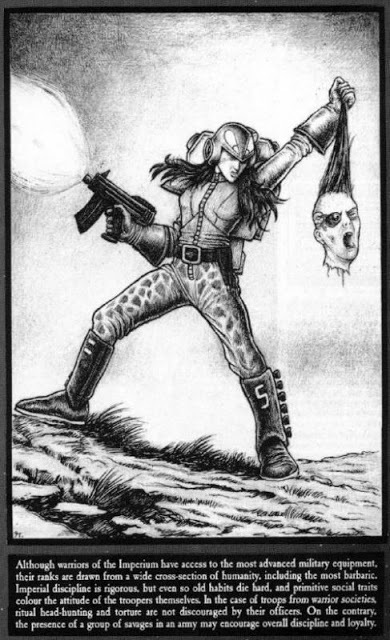 She’s a 28mm metal incarnation of the classic 1987 Rogue Trader illustration by Martin McKenna. Olivia leading the Godbreak 84th, showing her head for strategy. Other people who’ve painted their Olivias are: asslessman, axiom, Dr Mathias, Grove, Orlygg and Suber. Check ’em out! Grox are the cattle of 41st Millennium. 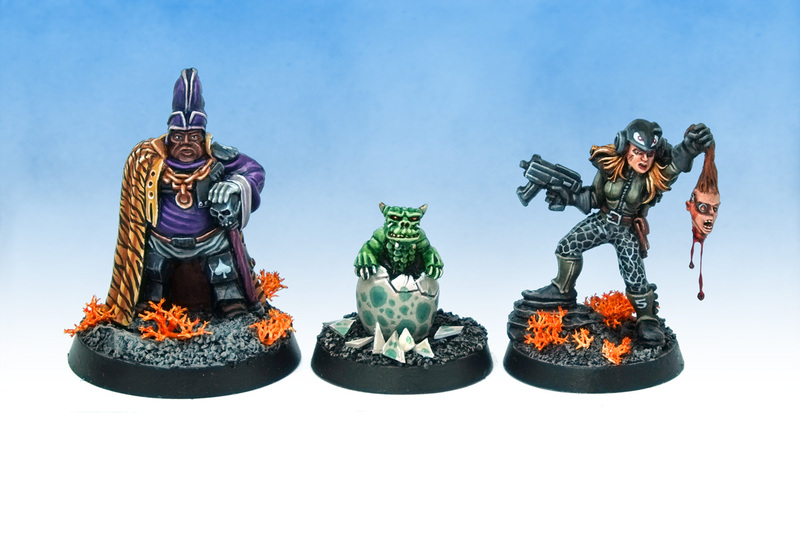 They appeared as an illustration in the 1987 Rogue Trader rulebook, though they’ve never had a miniature incarnation. 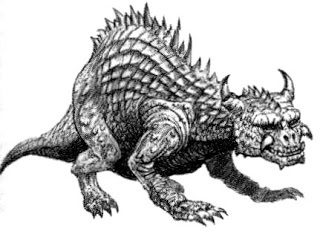 That was until axiom commissioned John Pickford to sculpt this cheeky little hatching Grox. Why? Cos axiom was running a Grox-herding participation game and going several egg-stra miles to realise the world of grimdark ranching. 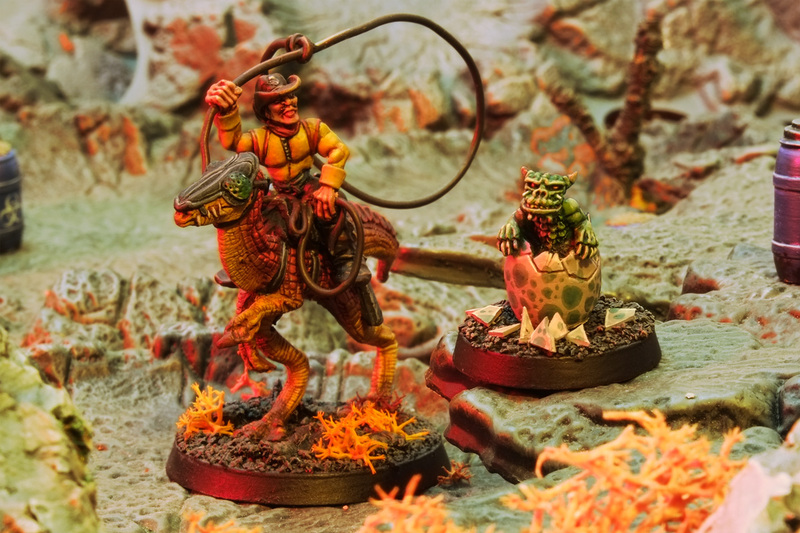 Mungo Beefhead lassoing a hatching Grox. Find out more about this Space Cowboy here. Curtis at Ramshackle Games sculpted this miniature to celebrate his massive participation game at BOYL 2017, set in Helsreach – the iconic Rogue Trader townscape. This miniature is really characterful and fun to paint, and on finishing it I immediately went and jumped some other Ramshackle bits to the front of the painting queue. The game is running again at BOYL 2018, and I recommend stopping by to drink in all those square feet of his miniatures and terrain Curtis, Aidan and Danny have put together. The Mayor touring the Cullentown Grox Incubation Facility. His Techpriest tour guide is regarded as the Helsreach’s leading “egghead”. 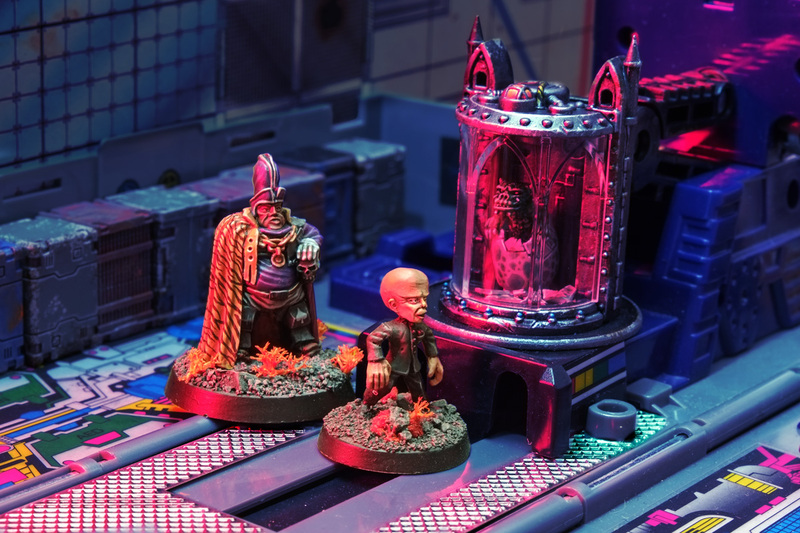 The Grox incubation chamber is a cut-down cryo-stasis piece from Games Workshop’s Sector Imperialis Objectives. The transparent “glass” component needed great care to resize – the plastic is so brittle any stress on it will cause massive white cracks to shoot through the whole thing. There were a few near-misses and lots of eggs-pletives. This year’s BOYL is almost upon us – Friday 3rd August to Sunday 5th August at Wargames Foundry, Nottingham, England. It’s my favourite three days in the gaming calendar. Hopefully see you there! Check out the site at for full details on games and location: https://bringoutyourlead.co.uk/. Wow Curis, that’s a particularly fab post, even by your top drawer standards, for several reasons. Bravo! You did such a good job on these, the Mayor in particular has never looked so good. Cheers sho3y. It’s easy to do stuff like this when you enjoy the miniatures this much. Egg-cellent painting and photography. Thanks for pointing out the BOYL website, for some reason I hadn’t even thought to look. Now I understand references to Jadeberry Hill, slightly. Thanks Sean! “Jadeberry Hill” is an obscure reference, and the name makes me think of a historical battle from like the American Civil War, rather than Warhammer 40,000. Inspired as always. Some lovely freehand details there- love the ace on the kneepad, and the painted eyes on the helmet in particular! Cheers Nick! The ace on the kneepad (and the shoulderpad) was sho3box’s idea. I’d initally tried stripes and numbers, but they looked too much like military armour plates. 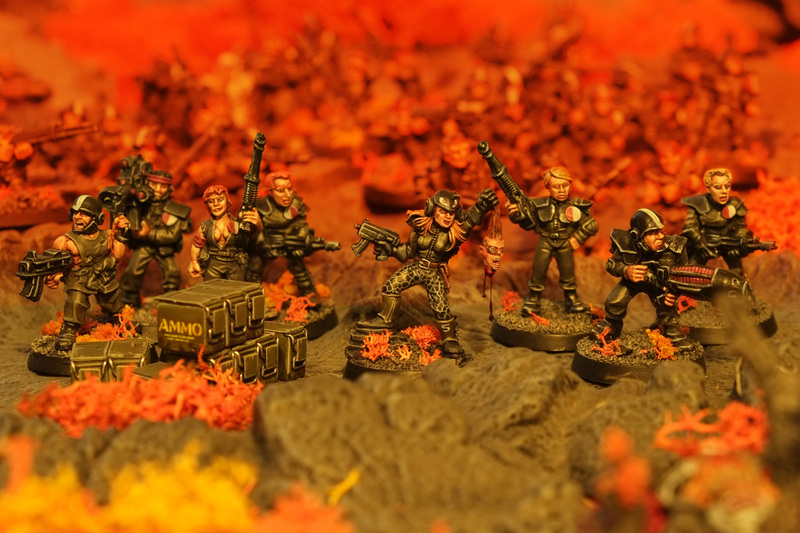 A fabulous set of paintjobs on a set of figures I’m very fond of! I really like the animal pattern theme running across all 3 figures. It ties them together even though they’re thematically disparate. Great work! Thanks axiom! I had a lot of fun painting the tigerstripes, I think you’re gonna see a lot more of them in the future. I particularly like the fact that the mayor’s standing on some extremely obscure and old-school scenery in that last shot. I’m not sure anyone else will recognise it, but I think it suggests that “You got the touch!”. Well spotted! You have the power! Brilliant–great job on some very cool figures.